The Sally Miller Gearhart Fund, created in honor of professor, author and activist Sally Miller Gearhart, promotes research and teaching in lesbian studies through a biennial lecture series and a future endowed professorship. The Gearhart Fund enables the Women’s, Gender, and Sexuality Studies Department (WGSS) at the University of Oregon to bring outstanding scholars to campus to discuss their work on topics such as gender and identity and its relationship to equality and social justice. Through public lectures, events, and activities, the fund disseminates research and increases awareness of lesbian studies. Students, faculty and the greater community all benefit from the expertise of visiting scholars. Such dialogue promotes diversity and greatly enriches the department’s overall mission to grow and enhance research and teaching in the area of gay and lesbian studies. With the private contributions in this fund, WGSS has hosted many lectures to date. The endowment was made possible by an initial challenge gift of $25,000 from Carla Blumberg, long-time friend of Gearhart and fan of WGS at the UO. Carla’s challenge gift was matched with an additional $25,000 from many private donors to create a permanent endowment and provide a lasting voice for lesbian studies in higher education in Oregon. Carla has also pledged to include the university in her will to one day create the Sally Miller Gearhart Professorship in Lesbian Studies. Carla’s commitment will position UO as one of the few universities in the country with such a dedication to sexuality scholarship. 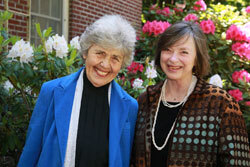 To read the original story on Carla’s historic gift and honoree Sally Miller Gearhart, please see the Summer 2009 Oregon Outlook article – Honoring Diversity and Courage. To make an online gift to the Sally Miller Gearhart Fund, click here. If you have any further questions about making a gift, please contact the College of Arts and Sciences Development Office at 541-346-3950. For more information about Sally’s life and activism, visit the Sally Miller Gearhart website.